It’s 2007 or early 2008, and Arturo, Alma, and Maribel Rivera have left Mexico to live in Delaware. Maribel had been in an accident a year or so earlier, and she needs to go to a special school. Alma finds that the best place is in Delaware. So they leave their village where they’ve lived all their lives, Arturo has found a job and a company who will sponsor him, all for the betterment of Maribel. They live in a run-down apartment building, full of other Hispanic immigrants. 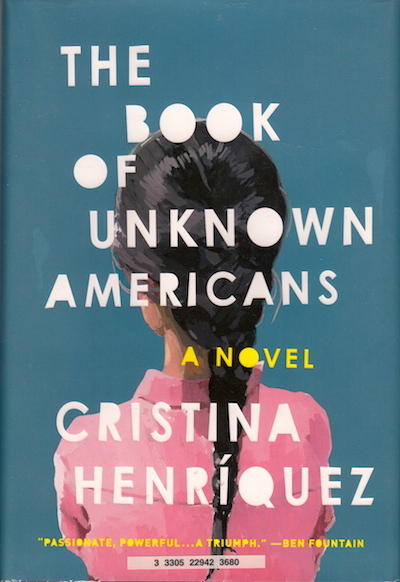 The Book of Unknown Americans is about the Riveras and their neighbors as they live their lives. There is a plot – Mayor is the boy next door who likes Maribel, and there is a bully at school; the market crash happens in 2008 and Arturo loses his job – but it’s mostly about making you see individuals. It’s a lovely little book full of touching vignettes. And it made me SO HUNGRY. All that delicious food described – so much of how people are doing in this story is shown through what they are eating. But also it’s about reading/telling stories that we don’t often see: poor people, immigrants, working class, brown skin. It’s about showing what’s universal – we all love food and we all love our families and we all work our butts off. Sometimes that breeds more success than others. If you have a few hours, it’s worth it.